Improving the Quality of Complex Treatment of Bekhterev’s Disease. Bechterev’sdisease, or ankylosing spondylitis (AS) is an autoimmune disease which affects up to 1% of the world population. AS affects the spine and large peripheral joints, including hip joints. AS may also be associated with other inflammatory diseases of the skin, eyes and bowels. Usually, the first AS symptoms are barely noticeable and can be expressed by frequent pains and stiffness in the lower back and pelvis. The most advanced stages of AS result in replacement of intervertebral discs with bone tissue, thus fixing the spine in a certain position and considerably limiting its mobility. Ages between 17 and 35 are the typical period of AS onset. The disease incidence rate among men is 2-3 times higher than that among women. Although AS treatment methods are well-practised, the medications used in its course treatment have a number of serious side effects. This is why a search for safe treatment methods which would allow to reduce the medicamentous burden appears to be appropriate and relevant. Purpose of the study: evaluation of the possibilities of improving the quality of Bekhterev’s disease treatment by including exposure to pulsed magnetic field produced by ALMAG-02 device as part of the treatment procedure. Within the two-year period between February 2010 and March 2012, 87 patients with a documented diagnosis of AS (according to the modified New York criteria) had been under medical supervision in the department. All the patients under our care were examined upon admission to the hospital and at discharge (at the beginning of the remission period). AS diagnosis was established after clinical laboratory and instrumental examination in accordance with the modified New York criteria for the diagnosis. Selection of patients for the study was conducted in line with the recommendations of the working group on the study of AS (ASAS, 2003). Among the examined patients, 81 were male (93.1% of the patients) and 6 female (6.9%), aged 18 to 60 years. The average age of the entire group of patients was 36.10±1.02 years: 36.6±1.08 for men, and 32.67±1.83 for women. The mean duration of the disease was 8.54±0.65 years. Disease history of under 6 years long was registered with 17 patients (19.54%); 6-10 years: 27 patients (31.04%); 11-15 years: 26 (29.88%); 16-20 years: 12 (13.79%); over 20 years: 5 (5.75%) patients. Disease onset, on average, was observed at the age of 24.8±4.5 years. In many cases (56.1%), onset of the disease was manifested by a feeling of stiffness, rigidity in the lumbar spine region, accompanied by pains in this area which appeared at night-time or after staying in a lying position for a long time. Less commonly, the disease began with pains in the gluteal region radiating to the thigh, which worsened during road trips (32%), as well as pains in the joints of hand, heel region (15.9%), or with eye diseases (11.7%). The disease clinical pattern most frequently included morning stiffness (91.5%), pains and rigidity in the lumbar spine (94.9%), night pains in the spine and joints (81.65%). Regarding extra-articular damages typical of AS, defects of the cardiovascular system (cardiosclerosis, myocardiodystrophy, conduction and excitability disorders, aortitis) were observed in 8 (9.19%) patients, disorders of the bronchopulmonary system (chronic bronchitis, apical fibrosis) in 12 (13.79%), digestive tract affections (chronic gastritis, enterocolitis) in 17 (19.54%), kidney diseases (pyelonephritis, nephrolithiasis) in 11 (12.64%), eye diseases (uveitis, iridocyclitis, cataracts) in 37 (42.52%) patients. Systemic symptoms were most frequently observed in patients with moderate to high degrees of process activity. Based on the degree of pathological process activity, the patients were distributed as follows: First degree was diagnosed for 21 (24.14%) patients, second degree for 52 (59.77%), and third for 14 (16.09%) patients. As recommended by the European League Against Rheumatism, BASDAI activity index was also used to determine the degree of AS activity. BASDAI index calculated for our patients revealed that for those with the first degree of activity it was: 2.40±0.5(SD=1.21) points; for patients with second degree: 3.68±0.14 (SD=0.98) points; third degree: 4.97±0.19 (SD=1.64) points. According to the relevant classification, three stages of AS are distinguished, which are graded on the basis of both clinical and radiographic features. In compliance with the classification, stage I (early stage) of the disease was confirmed for 21 (24.14%) patients, stage II for 49 (56.32%), and stage III (advanced stage) for 17 (19.54%) patients. European League Against Rheumatism also proposes to distinguish 4 stages of radiographic changes (BASRI index), taking into account the damages in the sacroiliac joints and the spine (frontal and lateral projections of the lumbar spine and lateral view of the cervical spine). For purposes of this study, the stage was determined based on the maximal changes in one of the above areas. Accordingly, radiographic stage I among our patients was established in 9 (10.35%) cases, stage II in 39 (44.83%) cases, stage III in 25 (28.73%), and stage IV in 14 (16.09%) cases. All the patients demonstrated clinical and radiographic evidence of sacroiliitis, which in 94.4% of cases was bilateral. Study entry criteria for AS patients were as follows: ages between 18 and 70; availability of informed consent; proven AS diagnosis based on the examination criteria; stage I – IV of AS as per BASRI index; severity of nocturnal back pain as per VAS ≥ 40 mm (based on 100-mm visual analogue scale) or severe pain in the peripheral joints (≥ 40 mm based on a 100-mm VAS); presence of at least one inflamed joint; and presence of primary sacroiliitis. Withdrawal criteria included: patients’ age below 18 and above 70 years; stage 0 of AS as per BASRI; severity of nocturnal back pain as per VAS ≤ 40 mm; concomitant severe somatic pathology; apparent intellectual and mnestic disorders; mental illnesses; after-effects of head injuries; neuroinfection and other organic brain disorders; idiosyncrasy of the conducted procedures; presence of secondary sacroiliitis. Based on the study objectives, AS patients were divided by random selection into three groups comparable in gender composition, age, and disease duration: the treatment group, which was receiving magneto-therapy with low-frequency magnetic field produced by “ALMAG-02” device; the group receiving “placebo”: a simulated exposure to magneto-therapy with low-frequency field imitating the actual procedures without connection to the mains; and the control group. Patients of all groups received identical courses of complex treatment, massage, and therapeutic exercise. Magneto-therapy with pulsed magnetic field was conducted in the following manner: the main emitter was used, which was placed on the cervicothoracic area of the spine with its north pole side turned towards the body; field density – 6 mT, frequency -16 Hz, exposure time – 10 minutes. After that, the emitter was moved to the lumbosacral area of ​​the spine, and the same procedure was repeated. The course comprised 12 daily procedures. Recommendations of ASAS, the Assessment of SpondyloArthritis International Society, were used as guidance for evaluation of the therapy results. Thus, the assessment study of the effectiveness of magneto-therapy with low-frequency magnetic field was carried out with regard to the trends of the following parameters: severity of back pain as per visual analogue scale (VAS); overall assessment of the therapy results by a patient (VAS); nocturnal back pain (VAS); morning stiffness; number of painful and inflamed joints, of painful entheses; functional status of the patients (BASFI questionnaire); mobility of the spine (Schober test); general weakness (VAS); ESR test score; C-reactive protein; and the daily need for nonsteroidal anti-inflammatory drugs in terms of the equivalent amount of indomethacin. In course of the above, not only the average values of individual parameters were compared, but also the effectiveness of treatment for each patient individually was determined. The overall assessment of the therapy effectiveness for AS patients was performed using the combined BASDAI (Bath Ankylosing Spondylitis Disease Activity Index) index and ASAS (Ankylosing Spondylitis Assessment Study) criteria. While studying the effect of magneto-therapy with low-frequency field on the psychological status of AS patients, the following standardized psychodiagnostic techniques were used: Spielberger-Hanin test to study the patients’ self-assessment of their state and trait anxiety level, and Beck Depression Inventory to screen their depression status. The patients’ quality of life assessment was carried out using the SF-36 health survey. The effectiveness of magneto-therapy with low-frequency magnetic field as part of complex treatment of AS patients was analyzed by studying the trends of clinical and laboratory parameters, as well as of the psychological status of patients during the treatment process, and by subsequent comparison of the results from the treatment, control, and placebo groups. In course of the above, not only the average values of individual parameters were compared, but also the effectiveness of treatment for each patient individually was determined. The effectiveness of combined treatment of AS patients was analyzed, depending on the activity level and the disease stage. As a result of conditional therapy in the control group and the placebo group, consistent changes were observed in: the pain scores as per VAS (nocturnal back pain and pain in the spine within 24 hours), the number of painful entheses, the number of swollen joints, the Schober symptom, as well as in the ESR score, CRP, and the daily need for NSAIDs, i.e. in 8 of the 15 parameters considered (p < 0.01; p < 0.05). At the same time, the treatment group demonstrated a consistent positive trend in the following parameters: VAS (nocturnal back pain and pain in the spine within 24 hours), morning stiffness in the joints and spine, the number of painful entheses, the number of swollen joints (p < 0.01; p < 0.05), BASFI index (p < 0.001 ), the global health assessment, Schober symptom, ESR score, CRP, and the need for NSAIDs (p < 0.01; p < 0.05), i.e. 12 of the 15 parameters considered. The most significant changes by the time of treatment end were revealed in such parameters as: pain in the spine and joints, severity and duration of morning stiffness, BASFI index. Also, the number of inflamed joints decreased positively. This indicates that magneto-therapy with low-frequency magnetic field was not only accompanied by an analgesic action, but also proved its ability to affect the activity of the inflammatory process, which was confirmed by both clinical and laboratory parameters. Furthermore, to evaluate the global effectiveness, the ASAS20 unified international improvement criteria and the Bath Ankylosing Spondilitis Disease Activity Index (BASDAI) were applied. Based of the above data, it can be concluded that the assessment of therapy effectiveness as per ASAS 20 criteria in the treatment group was significantly higher than in the control group (c2= 4.47, p=0.034) and the placebo group (c2= 4.617, p=0.032). Note: * – p < 0.05, ** – p < 0.01, *** – p < 0.001. 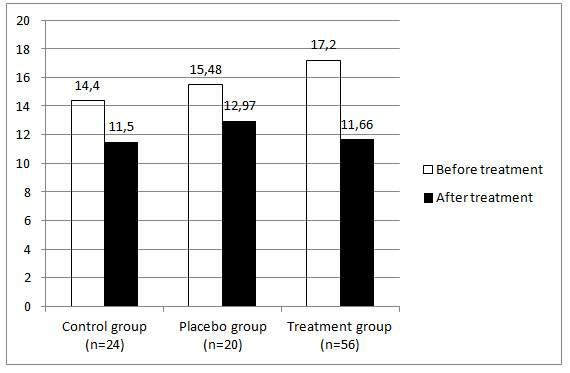 At the same time, all groups of patients demonstrated consistent changes in BASDAI 20 (at p < 0.001, p < 0.01), but for the treatment group these changes corresponded to 16.12 points, while for the control group to 9, and for the placebo group to 8.61, which is an indicator of moderate effect of the antirheumatic therapy provided. The obtained data imply, based on cumulative measured outcome, that the treatment results were considerably better in the treatment group of AS patients. Thus, it can be assumed that magneto-therapy not only has an analgesic action, but also proved its ability to affect the activity of the inflammatory process. Analysis of magneto-therapy effectiveness depending on AS activity appears to be of particular emphasis. The highest positive trend in the studied parameters was observed for degrees I and II of AS disease activity. Moreover, for patients with degree II of the disease activity, the positive trend was more pronounced: consistent changes in 13 out of 15 criteria of effectiveness were observed. For patients with degree I of the disease activity, the score was 12 out of 15. Meanwhile, for patients with degree III of the disease activity, consistent changes were recorded for only 6 out of 15 parameters referring to: pain syndrome (severity of back pain as per VAS during the course of the day and at night-time, morning stiffness in the spine), biochemical parameters of the inflammatory process (ESR, CRP), and the daily need for NSAIDs. The ASAS and BASDAI criteria were also used to evaluate the therapy effectiveness (see Diagram 2 and Table 2). As demonstrated by the above data, the best treatment results were obtained for patients with degree II of the disease activity. According to BASDAI criteria, for degree II of the disease activity, the changes throughout the treatment process were scored at 12.7 points, or 26.48% of the original value, which indicates a good therapeutic effect of the therapy, while in the group with activity degree III, the changes amounted to 7.77 points, or 14.9% of the original value. 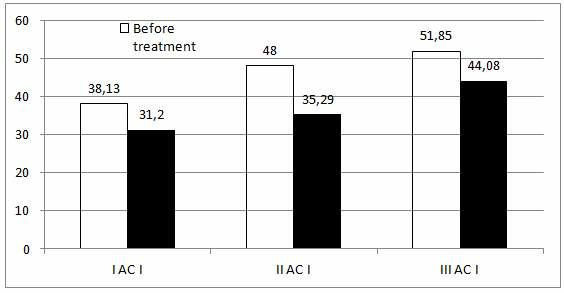 The patients with degree I of the disease activity demonstrated the therapy effect of 6.93 points, or 18.17% (moderate effect). Based on the data presented in Table 2, it can be concluded that the effectiveness of combined therapy as per ASAS criteria is higher for patients with degrees I and II of AS activity, while being positively higher for AS degree II as per ASAS20 (c2 =3.83, р=0.05). Thus, the obtained results indicate that the effectiveness of magneto-therapy with low-frequency field is more evident among patients with degrees I and II of AS activity than among those with degree III of disease activity. This result can be explained by the fact that, as stated by several authors, magneto-therapy with low-frequency magnetic field is highly effective for treatment of chronic diseases. Exposure to a magnetic field stimulates activation of the regulation system of local blood flow and enhances the resorption ability of tissues, which leads to weakening of the muscle tone, intensification of the skin’s excretory function, and edema reduction in the inflammation area. Analysis of the effect of magneto-therapy depending on the disease stage was also conducted. The most evident positive trend of the studied parameters was discovered for patient groups with stages I and II of the disease. For stage I of the disease, consistent changes were recorded for 12 out of 15 parameters. Meanwhile, for patients with stage II, consistent improvements of 13 out of the 15 parameters were observed (nocturnal and daily back pain (VAS); the number of inflamed and painful joints; BASDAI and BASFI indices; global health assessment; morning stiffness in the spine and joints; ESR; CRP; decreased demand for NSAIDs). At the same time, for patients with stage III of AS disease, consistent changes of only 8 parameters were recorded: those characterizing the pain syndrome and some biochemical parameters of the inflammatory process (ESR, C-reactive protein), as well as the daily need for NSAIDs. During the overall assessment of the effectiveness of structural resonance electromagnetic therapy (SREMT), each AS patient was tested using the ASAS and BASDAI criteria (see Diagram 3 and Table 3). According to BASDAI criteria, for stages I and II of AS disease, the changes during the treatment process amounted to 15.83 points, or 34.71%, and 24.55 points, or 39.41% (respectively) of the initial value, which is indicative of a good therapeutic effect of the therapy, while for the group with disease stage III, these changes were scored at 8.94 points, or 15.84% of the original value (minor effect). Based on these data, it can be stated that the effectiveness of combined therapy as per ASAS criteria is higher for patients with AS stages I and II. However, the values were visibly higher for AS stage II as per ASAS20 (c2 =4.47, р=0.034). This allows us to assume that SREMT is more effective and reasonable at stages I and II of AS. Meanwhile, the use of magneto-therapy with low-frequency field for treating patients with AS stage III had relatively little success, mainly affecting only the intensity of joint pains. This result can be explained by the fact that such stages of pathology progression are accompanied by developing irreversible organic damages to the articular system, which causes relative stability of many of the studied criteria of therapy effectiveness. Within the framework of this study, an attempt was made to explore a wider range of therapeutic actions of magneto-therapy on AS patients. With that in view, the effect of this treatment method on some parameters of the patients’ psychological state was studied. Diagram 4. 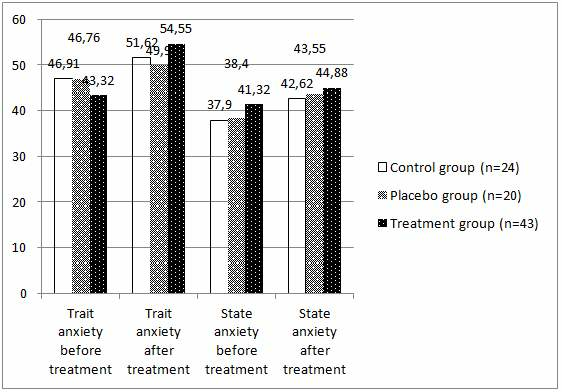 Changes in the state and trait anxiety level of AS patients during treatment course as applicable to the treatment, placebo, and control groups. AS patients of the treatment, placebo, and control groups are characterized by high levels of both state (SA) and trait anxiety (TA). Furthermore, a correspondent symmetry of TA and SA levels was observed (high values on one scale are accompanied by similar values on another scale). This indicates that AS progression is accompanied by development of increased anxiety as an actual psychological state and a steady personal feature. During the treatment process, the TA and SA values tended to decrease, but a consistent positive trend of these values was observed only in the group of patients receiving magneto-therapy (SA p <0.01). These data give evidence of the effect of magneto-therapy not only on the pain syndrome and exudative processes in the joints, but also, apparently, on the normalization of homeostatic processes in the organism as a whole, including those in the central and autonomic nervous systems. AS patients of the treatment, placebo, and control groups demonstrated moderate levels of depression prior to treatment start. Note: * – p<0.05. ** – p<0.01,*** – p<0.001. Upon completion of the therapy course, the treatment group showed consistent decrease of the depression level (p <0.05). Although a certain decrease was also observed in the control and placebo groups, its values were statistically unreliable. This effect was possibly related to the influence of magneto-therapy not only on the pain and inflammation factors, but also on the activity of the CNS, autonomic nervous and endocrine systems. This was accompanied by changes in the responsiveness of the receptor system, stimulation of endogenous opiate peptides production, and improved microcirculation. In this context, the use of magneto-therapy within complex treatment of AS patients is aimed not only at improving their physical health condition, but also at reducing their mental maladaptation and emotional discomfort. At the following stage of the study process, the effect of magneto-therapy on the AS patients’ quality of life was looked into. Analysis of the AS patients’ quality of life indicators over time (the questionnaire was filled upon hospitalization and after completion of the treatment course) demonstrated the results as shown on Figure 6. It is worth noting that the surveyed AS patients had low indicators of quality of life on all scales of the questionnaire. The lowest indicators were observed prior to treatment start. Primarily, a restriction of role functioning both due to physical condition and emotional state was recorded. To the most extent, the physical and physical role functioning (RF, RP) suffered, as well as the indicators of bodily pain (BP) and emotional role functioning (RE). It can thus be concluded that it is AS patients’ physical activity that is especially impaired, which greatly complicates the execution of their day-to-day activities, both at home and at work. This undoubtedly produces a negative impact on a patient’s psychological state and causes problems in various areas of their life. Combined therapy, including magneto-therapy, had a positive effect on the key parameters of the AS patients’ quality of life. It was discovered that AS patients within the treatment group demonstrated a consistent increase of the indicator values which reflected the physical component of their health: physical functioning (p<0.05), physical role functioning (p<0.05), and bodily pain (p<0.01), as well as the emotional role functioning (p<0.05), general health perceptions (p<0.05), and mental health (p<0.05). Diagram 6. AS patients’ quality of life indicators within the treatment group before and after treatment course. * – p < 0.05, ** – p < 0.01, *** – p < 0.001. 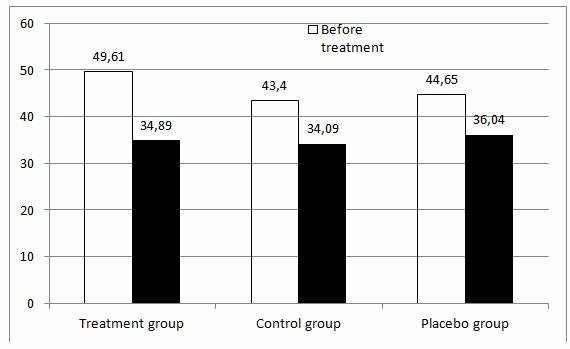 For AS patients receiving placebo and patients from the control group, increased indicator values of all scales of physical and mental health were observed at the end of the therapy course. Nevertheless, only the parameters of physical functioning, bodily pain, and mental health changed consistently (p<0.05). The above results suggest that the patients from the treatment group showed positive improvement of both physical and mental health indicators. Regarding the group of patients who received only conventional therapy and placebo, the results of assessment of the physical and mental health indicators were similar; however, positive changes were observed in a fewer number of indicators. The following two scales of the questionnaire deserve special attention: Physical role (RP) and emotional role (RE) functioning, which indicate the severity of problems at work and during execution of daily activities related to physical and mental health condition. This bears evidence of the fact that application of this treatment method considerably improved the patients’ emotional state and physical health during execution of daily duties and at work. This also confirms the data on high effectiveness of this therapy method. Special emphasis should be laid on the absence of side effects of magneto-therapy and the resulting possibility of its application on patients who are intolerant to certain drugs. Based on the above, the results of the conducted study prove the high effectiveness of magneto-therapy with low-frequency magnetic field generated by “ALMAG-02” device as part of complex treatment of AS patients; furthermore, the results demonstrate a wide range of therapeutic actions of magneto-therapy, including the vascular system-supporting, analgesic, anti-inflammatory actions, as well as positive effects on psychological disorders and quality of life. Usage of magneto-therapy within complex treatment of AS patients can significantly improve the general results of the disease treatment and can be recommended for wide use in rheumatology practice.